Mini Doughnuts, Mega Love: Happy Doughnut Day! The history of the doughnut is decidedly, well, undecided, but with a little investigation and some help from a doughnut connoisseur, I was able to fill in the holes – or as we call them in Canada, timbits. With over 1 billion doughnuts now made in Canada each year, and the highest doughnut shop per capita of any nation in the world, this tasty treat has clearly stood the test of time and will undoubtedly remain a national favourite. For a deeper dive into the world of mini doughnuts, I spoke to someone with a little more expertise for some behind-the-scenes insight. 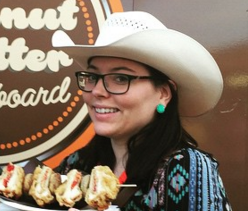 Jessa Johnson Bedford grew up in what would likely be many kids’ dream – heir to a mini doughnut empire. Originating as Tom Thumb Donuts at the Minnesota State Fair in the sixties, her grandfather’s doughnut business has a history almost as golden as their addicting bite-sized rings of dough. A welder by trade, the patriarch of the family was first exposed to the world of mini doughnuts when commissioned to make repairs to the machines. One taste was all it took, and he soon traded his blow torch for a baker’s hat, which he would eventually pass down through generations to come. Eventually, the doughnut business ventured across North America to the untapped market of the Wild West where they made their debut at The Calgary Stampede in 1968, and have remained ever since, finally taking on the name Those Little Donuts in 1984. Over the past half century, the menu has stayed true to the original form in which doughnuts were first created: plain and simple, or coated in that heavenly blend of cinnamon and sugar. Though the cinnamon sugar versions are the acknowledged favourite of Stampede patrons, Bedford recommends giving the plain a chance too. Graciously undertaking the role of recipe tester and taster, Bedford has topped her plain doughnuts with everything from maple syrup to peanut butter – but insists that a simple drizzle of chocolate syrup makes for the tastiest combo of all. Given the demand, it was no surprise when Bedford revealed that they have often been asked if they would consider establishing a permanent location so customers could enjoy their doughnuts all year round. 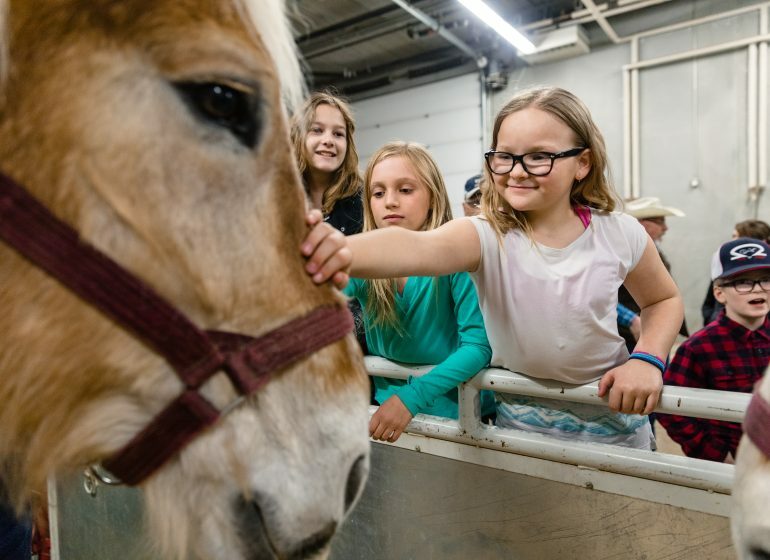 However, don’t expect to see a shop opening up anytime soon – Bedford insists this would “diminish the magic” of the once-a-year treat, and equates their annual appearance at the Calgary Stampede to “Christmas in July” – a comparison I am sure we could all appreciate. 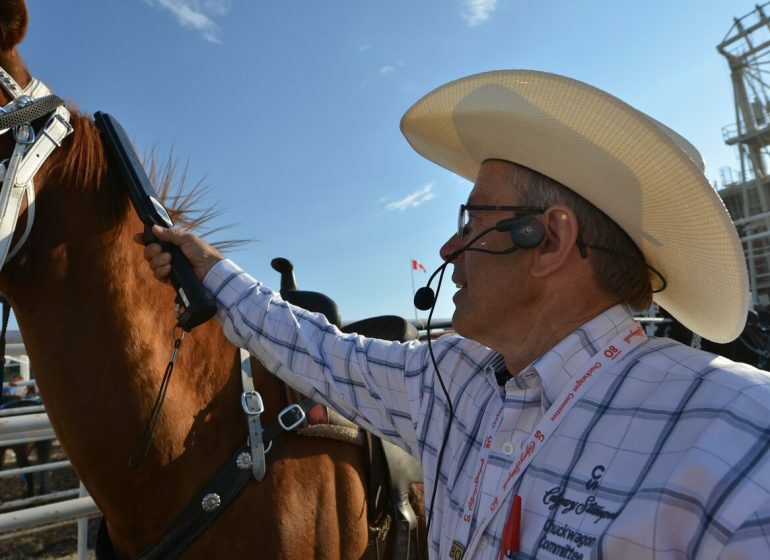 In Bedford’s words, “the whole point is that Stampede comes once a year, and is an opportunity to really indulge – something to look forward to”. It’s no surprise then, that each year they sell more bags than they can keep count of, as fans of the business take advantage of the novelty of getting a bag (or two or three) during the Stampede. Wherever you find yourself on this delectable day, I hope you are able to celebrate accordingly with a doughnut in hand – but if not, here are just a few of the many doughnut inspired treats that you can look forward to enjoying on the Midway this Stampede! 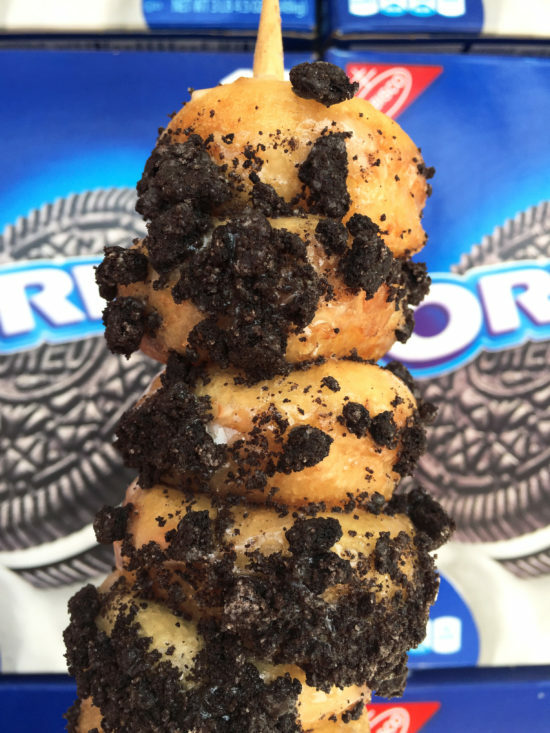 Mini doughnut, meet cookies & cream. Fans of each will fall in love with this combination of glazed mini doughnuts coated in chunks of cookies and cream biscuits – and wonder why they haven’t been enjoying them this way for years. What really makes this treat top our list? The fact that in true midway fashion, the whole thing can be enjoyed off a stick. 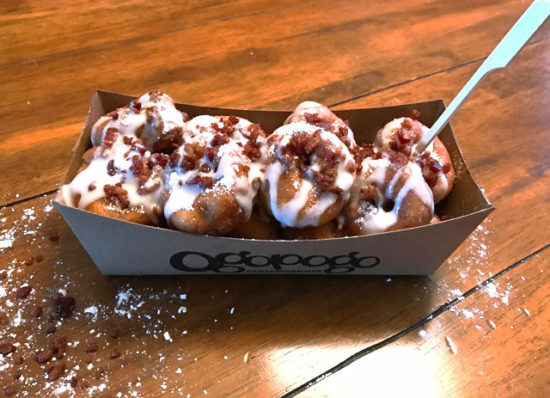 Fresh, warm mini doughnuts are topped off with a dash of cinnamon and icing sugar, a drizzle of delicious maple glaze to finish it off, a sprinkling of real chopped bacon! We can’t think of a better (or tastier) way to wish Canada a Happy 150th Birthday! 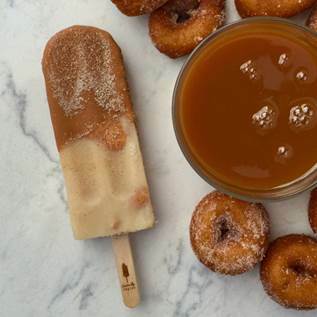 Tied for “Best New Food” on the midway in 2015, the Mini Donut Ice Pop has quickly become a Stampede staple, incorporating real chunks of mini doughnuts right into a cinnamon spiked dulce de leche ice cream base. This year, the pop gets a new-and-improved upgrade with a caramel dip and a sprinkle of sugar. You can be sure that this will be one of those rare times the sequel is even better than the original. 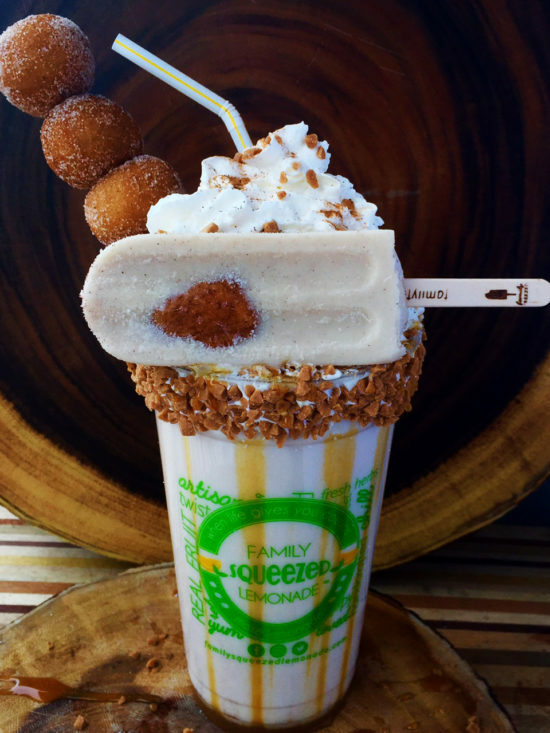 Creamy and dreamy, this milkshake will be the perfect way to get your doughnut fix while refreshing yourself in the heat of the Midway. Sprinkles fill the doughnut-flavoured shake, and the whole thing is topped off with a full-sized, dipped and sprinkled doughnut. We’re willing to bet this beverage is more Instagram-able than the Unicorn frap, and is almost (almost!) too pretty to drink. If the Ice Pop isn’t enough, up the ante with this monster thirst-quencher: ice-cold cinnamon dulce rice milk, rimmed with toffee bits and then topped with whipped cream… sprinkle more toffee bits, cinnamon toast crunch cereal, and caramel drizzle… and then finished off with a stick of Stampede award winning Moose Balls and a Mini Donut Ice Pop on top! 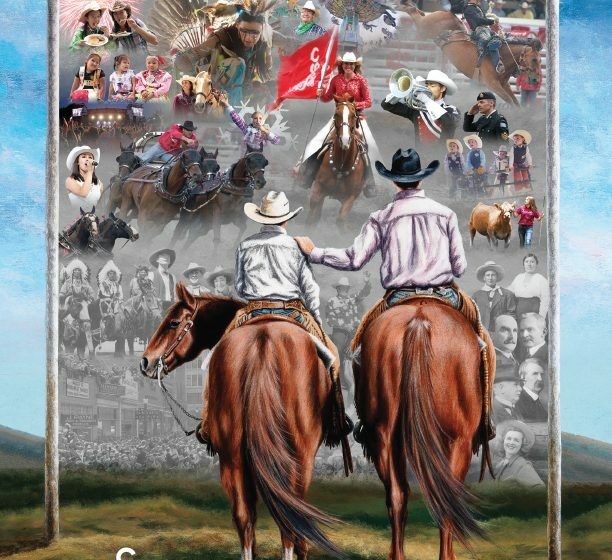 The C of Red gets first look at the 2018 Stampede Poster!